The “Year in Review” has been a theme across the blogosphere this week and though I’m a bit belated—having been busy cramming some lovely last-minute activities into 2011 like skiing and fireworks in an area of the country where a good internet connection is hard to find—I thought that it was a worthy effort to give a fond farewell to all the excellent highlights of the past year. ‘tis been a good year indeed! On a side note, over at Writer’s Relief, they’ve complied a round-up list of their best and most popular writing articles from 2011. I think it’s an excellent collection and they can help inspire some New Year’s resolutions for better writing and better submission habits. Another good resolution would be to sign up for the free Writer’s Digest newsletter! 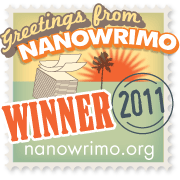 It’s chock-full of inspirational articles, writing prompts, and contest information. I know that since I graduated, I’ve been surrounded by less and less writing students, writing professors, and pressing due dates. Both of these newsletters do a good job of filling that hole by offering encouragement . . . or, when I’m more reluctant to compose something new, preferring to burrow under the covers and procrastinate with a book, the newsletters succeed at nagging me and reminding me of my writing goals. Here’s wishing that 2012 is even better than the last! *Waves at you through computer screen. Thanks for the reading material. I’m new to your blog, but I majored in creative writing and history as well (weird) and graduated in 2010 and started working on a literary magazine. I just thought it was interesting the coincidences. Good luck with all your writing and publishing creds! Hey Cassie, that is funny how similar our majors/jobs ended up being! Everyone at my college majored in Creative Writing and Education, or History and Education, so I always felt like the odd-one-out. What literary magazine do you work at? Wow, 2011 has be an incredible year for you. I hope 2012 is even better. Congrats on all of your success. I wish you even more. I’ll appreciate it if you checked out my blog http://janachantel.com/ it’s about me trying to become a successful published author. Be sure to check out my latest post http://janachantel.com/2012/01/03/daughters-of-eve/. And please feel free to follow!